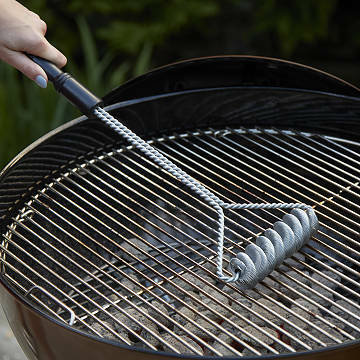 The springs on this brush conform to any grill's contours to tackle tenacious, burnt-on food. Keep your grill clean-and your food safe-with this innovative grill brush design. It features two continuous springs to get the grease and food particles off your grill grates, but has no rough edges to cut you, or dangerous metal bristles that could fall out and get into your food. The self-contained springs conform to any grill's contours to tackle tenacious, burnt-on food, and will last longer than traditional brushes. Made in Plattsburgh, New York. Make it a set with the Tabletop Portable Grill. Hand wash with hot water and dry immediately. This was a Christmas present for my husband, but snow has kept the barbeque covered until now. I used it for the first time and was very pleased. The brush is sturdy and well constructed. Designed to clean the grill well and safely. Loved this! It doesn't have the pieces that break off of the brush anymore. I've heard so many stories about the bristle brush grill cleaners putting people in the hospital because pieces of metal break off in their food and get caught in thier throat. I bought this for my husband so that won't happen to my family. I live the design. It appears to be sturdy and good quality. Useful for an outdoor grill as well as stuck on food in your oven. This thing is gigantic! We only had a small one so he is thrilled! It's the little things as you get older, ya know? Fantastic design, must appreciated gift! design and function easy to handle! Sad part about my purchase, the NY cork holder arrived broken due to improper packaging! Need to be away of this issue. Grill brush is high quality, and my husband loved it !! !